I was thrilled to have the opportunity to host a shower for my niece last month. She is having twins, one boy and one girl. I grew weary and disappointed after looking and looking online for cute twins-themed invitations. So, I decided to take things into my own hands and develop something of my own. Once the basic concept was set, it turned out to be a TON of fun thinking of all the different ways to apply it. 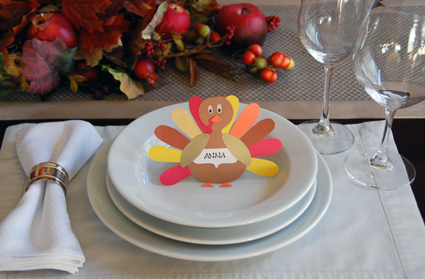 I got to be creative in the kitchen and in a variety of paper craft projects. Here’s how it unfolded. It all started when my niece told me about “the cutest” clothing line she ran into at Target with little monkeys. 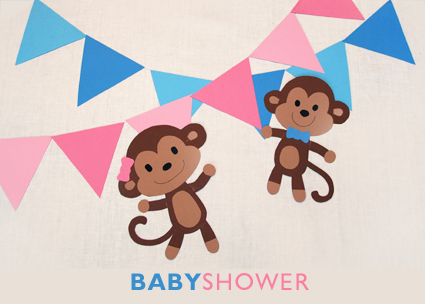 I knew that she loved them for her babies, so why not use them as the theme for her shower? I took a quick trip to Target and snapped a few pictures of the clothes to get started. I loaded the photos onto my computer and traced them using Adobe Illustrator and made print-outs as my patterns. After that, it was a matter of cutting, tracing, more cutting and gluing. I’ll admit it, it was a couple of nights of work, but so much fun to make these little guys. I also wanted to add a bunch of color without having to resort to crate paper streamers. 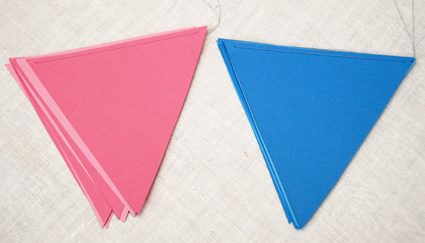 By cutting large triangles out of 12″ square paper I bought at the craft store, I was able to string them together and make some really adorable pendant banners to hang all over the house. Each sheet of paper made 6 triangles about 6″ tall and 4″ wide. I used regular old sewing thread and a needle to string them together. When the party was done, they folded into nice little bundles that I can save for use at another party. 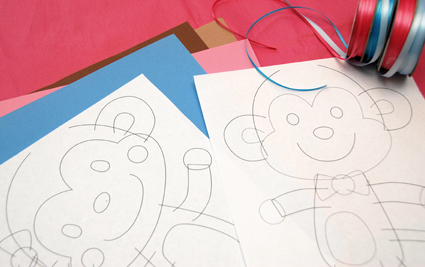 There are a host of other ways that I applied the monkey design in preparing for the party. Once the design was set, it was really easy to copy and paste the images onto all sorts of things. 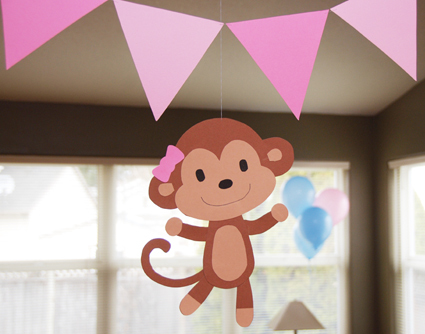 Here is a picture of all things monkey for the shower. I printed and assembled the invitations at home. I also printed my own monkey stickers and used them on the envelopes. 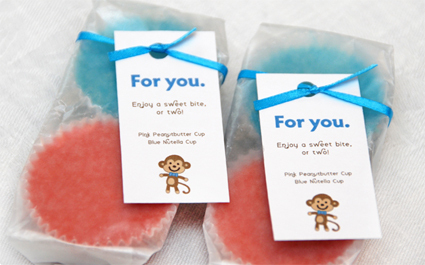 All of the prizes for games and favors were also labeled and tagged with matching monkey labels. Here is a close-up of the favors. 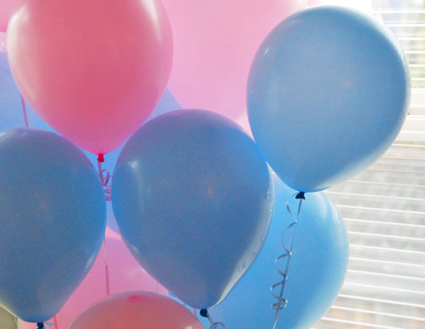 To celebrate her boy and girl twins, I carried a pink and blue theme through almost everything. The blue candies are Nutella-filled chocolate cups, and the pink ones are peanut butter filled chocolate cups. I could have left them out on a plate, but wrapping them up and putting a little tag on really made them feel like something special. Balloons were an easy and very affordable way to get a lot of impact for little effort. I set a few bouquets around the house to really make the pink and blue effect pop. Here’s where creativity in the kitchen set in. Wherever possible, the foods were colored to match the theme too. I chose to make my own brunch muffins for use of the pink and blue liners, and, well…. it was just another good reason to make macarons too! 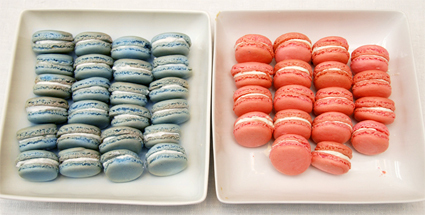 Here are the macarons how they were served at the party – all sorted by color. I made one big batch of batter and split into two before adding the food coloring. All in all, it turned out to be a great shower. I feel a little spoiled because I got to have all the fun planning and putting things together. Best of all, my niece was very happy with her special day and even asked to take some of the decorations home to use in her nursery. That made it worth every ounce of effort! The Valentine’s mood has arrived a little early in our house this year. I found myself wanting to try something new and festive in the kitchen, and voila! 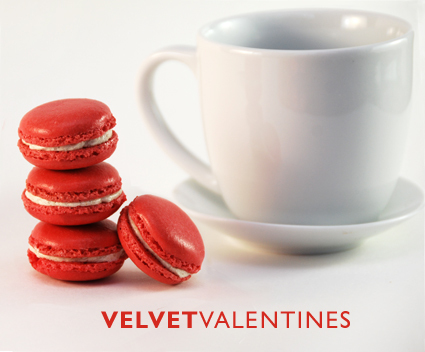 I stumbled across a great article at Delectable Deliciousness about these Red Velvet Macaroons. If you’ve been intimidated by macaroons, I hope this gives you encouragement to try them at home. They are not so illusive as you might think! 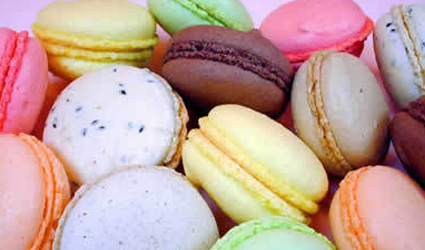 With a crunchy exterior and softy chewy interior, macaroons are notoriously difficult to bake. At first read the recipe seemed intimidating, but a second review gave me confidence. The original author piped her macaroons into adorable heart shapes, but I played it safe and stuck to a simple drop-cookie shape. I think I will try the hearts my next go around. 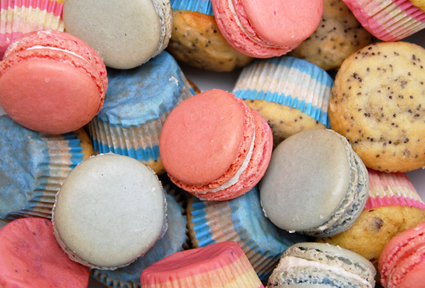 If you are new to macaroons, they can me made in any color and flavor combination the imagination can dream of. They are beautiful, each one having it’s own unique personality, but all sharing the same qualities of that amazing crunchy, fluffy, chewy texture. They are worth trying! This recipe called for an almond-flour dough combined with an Italian meringue mixture (hot sugar syrup and fluffy egg whites) to form the cookies. The filling is a cinnamon buttercream frosting that is delicious in its own right. As the author noted, the little amount of cocoa added for a red velvet flavor in the cookies didn’t really come through. The end result tasted more of almonds and cinnamon – a very tasty combination! We served these chewy and creamy treats to our guests the day of baking and let them sit out overnight. The cookies got even more fluffy and tender the next day. Here is the recipe from Delectable Delicousness. Enjoy! Sift together the almond flour and confectioner’s sugar. Mix in the egg whites to create the “mass” (mixture will be very thick). Add in your desired amount of red food coloring and mix well. Note: I didn’t measure the amount I used, I just kept adding until I had a bright red color, keeping in mind that the color will be diffused a bit when the Italian meringue is added. Bring water and sugar to a boil until it reaches 239F on a candy thermometer. Start whipping your egg whites in a stand mixer to soft peaks once your sugar/water mixture reaches 239F. Continue boiling your sugar/water mixture while simultaneously whipping your egg whites. Once the sugar/water mixture reaches 245F, remove from the stove and let bubbles settle. Turn your mixer to low-medium speed and slowly pour in your sugar syrup mixture while continuing to beat the whites. Beat until you get soft peaks that gently food over when you turn the whisk upside down. Fold in 1/4 of your meringue mixture into the TPT “mass” to lighten the mixture. Gently fold in the remaining meringue until the mixture “flows like magma”. Transfer to two pastry bags with a plain tip. Pipe cookies onto parchment-lined baking sheets and bake at 350F for 12-20 minutes. Transfer the mixture to the bowl of stand mixer and beat on high, using the paddle attachment, until cool. Reduce mixer speed to low and add the butter, piece by piece, beating until thoroughly incorporated. Add the vanilla and cinnamon. Increase speed to medium-high and beat until frosting is light and fluffy. If frosting is too soft, chill in the refrigerator and then beat again until proper consistency. What better way to start off the new year than with a healthy and comforting boost of energy. These low fat bran muffins are my “healthified” version of a long-time family favorite recipe. Despite the removal of nearly all oils and fats, they have a super dense and moist consistency, much like a brownie, and they taste of a sweet/savory pumpkin spice. They are chalked full of vegetables, fruit and whole grains, yet it feels like you’re eating something devilishly indulgent from a pastry shop. I feel like I’ve duped the system being able to eat them guilt-free. 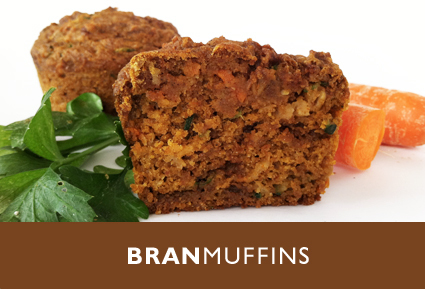 These low fat bran muffins not only have two types of bran, they also have zucchini, pumpkin, carrots and applesauce among other healthy ingredients. At 190 calories per muffin, they make for a very satisfying breakfast or morning snack paired with a piece of fruit and a nice hot cup of coffee. The recipe makes 24 regular cupcake-sized bran muffins. I like to separate my batter out into 6 storage containers with enough to bake up 4 at a time and keep them in the freezer. Because these muffins are so full of fresh ingredients, the batter will spoil and deteriorate in a matter of days. Just move the container out of the freezer and over to your fridge the night before you want to bake a fresh batch. Do not be tempted to pull these guys out of the oven too quickly. Because of the vegetables, the batter carries a LOT of moisture that has to be cooked out. I use the toothpick method to test for doneness. When it comes out clean from the center, I bake them another 5 minutes. I assure you, these muffins always manage to come out very moist and rich. Makes 24 servings. 190 calories per serving. This makes a LOT of batter and will nearly fill the bowl of an electric mixer. Preheat oven to 375 degrees. Mix bran cereals in a large bowl with the boiling water and let sit (it should turn thick and mushy after a few minutes). Meanwhile beat the butter and sugar in a large mixing bowl until light and fluffy. Except for the bran mixture, carrots and zucchini, beat in all other ingredients. Next add the bran mixture. Incorporate the shredded carrots and zucchini until just mixed in evenly. Divide evenly into 24 muffin tins and bake for 20-25 minutes or until a toothpick inserted into a muffin center comes out clean. Bake an additional 2-5 minutes to make sure muffin centers are not too moist. Enjoy! My sister is engaged! I wanted to do something really special to celebrate the upcoming year with her and make every month of planning and preparation something to be treasured. Inspired by a Christmas advent wreath by Martha Stewart, I put together a wedding advent wreath that counts down to her big day. She gets to open one box every month, each one containing a personal note and a small gift to make her feel wonderful. If you are looking for that perfect gift to give for the bride-to-be in your life, this is just the thing! 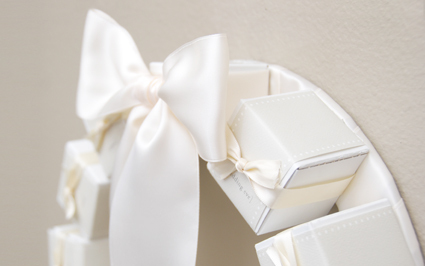 Each box is labeled with a different month to tell the bride which box to open. 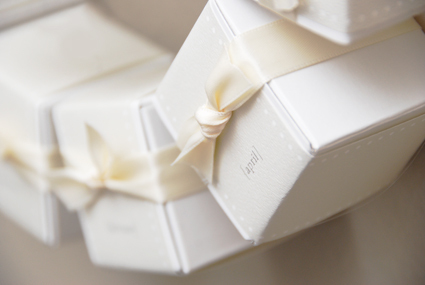 There is also one additional box for the day before the wedding with something a little extra special. I printed these labels on my computer, cut them into long strips, and wrapped them around the boxes. The hardest part is choosing the right colors and design. The assembly is a snap. The wreath is made from a wood base, bought from a local craft store, and wrapped tightly in satin ribbon. The boxes are individually decorated then attached with a hot glue gun. It is held up by a small loop of sturdy fishing string tied around the base. The best part of making this wedding wreath was assembling the boxes and deciding what to put into each one. Here you can see a sample of a note that I included to accompany a gift in each box. 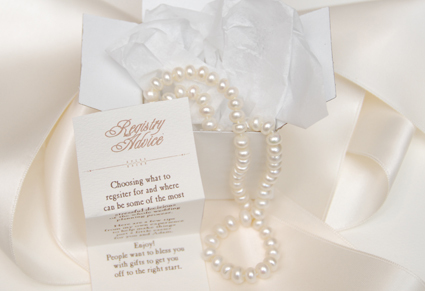 Not every box has a gift per se; some are merely notes from the heart, bits of advice, even poetry and comical notes about weddings. I also tried to stuff a tasty piece of chocolate into each box that afforded me the space. Who doesn’t like to get come chocolate every now and then? 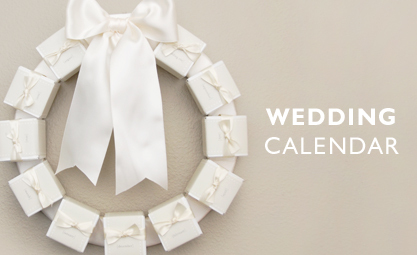 The first month of this calendar has a one-year subscription to a bridal magazine to help her get started with the planning process. If you want make your own wreath, the options are limitless. Include notes from other family members. Give her something old, something new, something borrowed and something new. Collect items of historic value from your family to hand down to the bride. Think of her favorite activities and things and include gift certificates. In designing the wreath, I chose colors and a style that matched what my sister had chosen for the wedding. This way I knew it would be something that was in line with what she would like and treasure in connection with the whole experience of planning the wedding. If make a wreath, be sure to consider the bride’s choice of colors and wedding style. 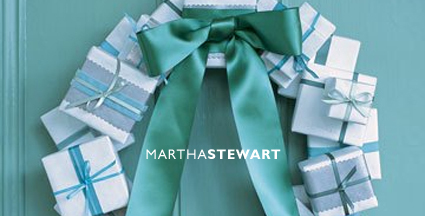 Here is a photo of Martha Stewart’s Christmas gift-box wreath that first inspired my wedding “advent” wreath for my sister. It gives you another idea of how it might come together with different colors and a different number of boxes. Now that my kids are growing old enough to get excited about the holidays, we’ve done a few things around the house to get ready for Thanksgiving. 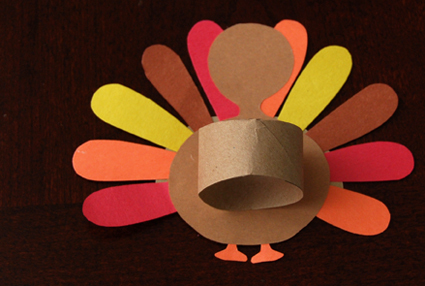 These turkeys are made from construction paper, glue, and an empty toilet paper ring that acts as a stand to hold them upright. 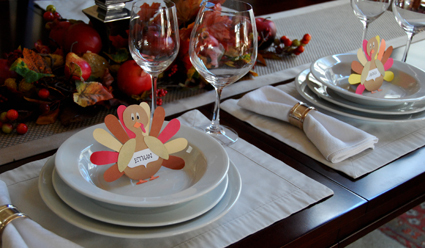 They double as great place card holders and/or napkin rings to set around the dinner table. Making the turkeys were a ton of fun to assemble while we talked about our family traditions that surround the big meal. In fairness, the preparation to make these guys was quite a bit of detailed work that didn’t lend itself to kid craft time. The tracing and cutting of the pieces required a bit of concentration. If you want to give this a try at home, you can download the pattern here! 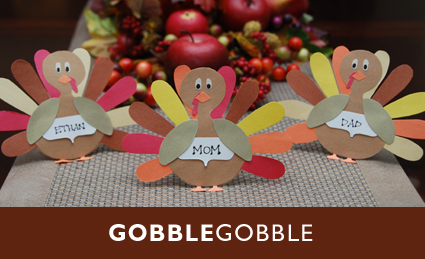 For adding a whimsical touch to at Thanksgiving table, these turkeys are the perfect touch. Each turkey takes on its own personality as the pieces and colors come together a bit differently for each one. The name cards are not glued on, so they are interchangeable if using for multiple events. They have been a great hit with my family so far this season. Here is the back side of the turkeys. I cut a second body shape to glue on the back side and cover up the base of the feathers that were glued all around the belly. I also chose to leave the toilet paper ring as-is for time’s sake. You could easily cover it or make the rings out of another color. They are simply glued on. If you missed it above and want to make these at home, I put together a pattern that you can print out and use a guide. Download it here. I would LOVE to hear your feedback if you find it helpful.